Wrap your hands around this customer favorite and you won’t want to set it down. 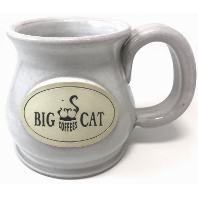 Its rounded style makes holding this mug a comforting experience. Skillfully handcrafted in Wisconsin — 12 ounces; 3.625”h. Dishwasher, microwave and oven safe. 100% lead-free. FDA and California Proposition 65 compliant. Ounces may vary. Due to the nature of handmade processes, styles and glazes will vary in consistency resulting in unique appearances. The Frosty Flake glaze is bright, like a moonlit night with new-fallen snow.